If the Emperor was aboard of naval (or other?) ships before mid-19th century, I found no record of a special flag used - presumably some kind of imperial flag used on land would be hoisted aboard also - however, I have not studied this deep enough to claim either. The final result of the long discussion over the change of the naval flags at the beginning of 19th century was the introduction of the distinction flags. "FLAG c. 1895 Empress of Austria 's STANDARD 88" x 92"
Personal flag representing the Empress of Austria ("personal" not referring to ownership but rather to representation of a person). 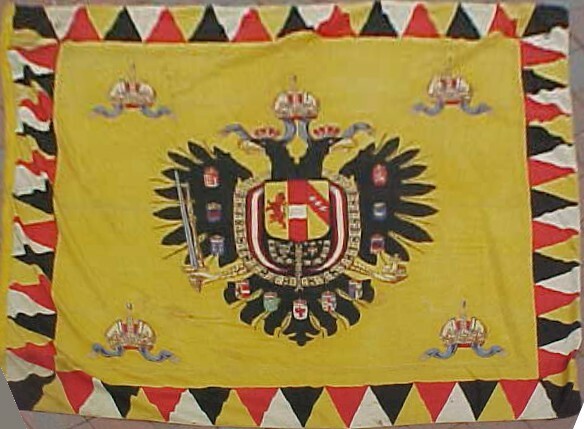 The Lesser Austrian Imperial Arms are centered on a gold background with a gold, black, red and white triangulated border. The eagle is surrounded by eleven shields of the Empire's provinces: Hungary; Lombardo-Veneto kingdom (the snake azure of Milan and the lion of St. Mark of Venice); Illyria; Siebenergen (Transylvania); Moravia impaling Silesia; Tyrol; Austria above the Enns impaling Austria below the Enns; Salzburg; Styria; Esclavonia (sic, actually Galicia and Lodomeria); and Bohemia. Various orders are displayed beneath the shield of the Habsburgs. A depiction of the Crown of Rudolf II, later Crown of the Austrian Empire, is placed in each of the four corners indicating that this is the empress' " flag ". This type of flag, called a "standard" would be flown to indicate that this personage was present at a location or presented to a person, organization or group indicating royal favour. This standard measures 88" x 92". It is made of a course fabric (wool) and is definitely a service flag having strong reinforcements for displaying or flying. Dates to the later part of 19th Century, though no later than 1915. Having written my Honors Thesis on the Empress Elisabeth of Austria-Hungary (known to one and all as 'Sissi'), I think I can speak with some authority on this flag. The Empress, who was a member of a cadet branch of the House of Wittelsbach, the Bavarian royal family, was married to the Emperor Franz Joseph in a typical loveless dynastic marriage. She was artistic, cultured, and above all very beautiful, and her husband had no idea what to make of this exotic creature with whom he had been saddled for dynastic reasons. For that matter, he had virtually nothing in common with her, a very dull, boring husband. She duly produced an heir, the luckless Archduke Rudolf, who allegedly shot himself and his mistress, the Bohemian Countess Marie Vetsers (Bohemian both in ethnic origin and in artistic proclivities), although there is apparently some doubt over this; recent research has suggested that Rudolf had been in negotiation with some Hungarian secessionist elements to become the ruler of a breakaway Hungarian kingdom. The Austrohungarian secret police, which was one of the few elements in the ramshackle Dual Monarchy, apparently got wind of this and presented a dossier to Franz Joseph, who may well have given Rudolf the classical officer's option, Vetsera being merely a pretext. As for the flag itself, Elisabeth was assassinated by an Italian anarchist in the 1890s. When he was arrested the perpetrator insisted that his act should not be construed as being one of personal hatred. He said that he thought that Sissi was beautiful and sweet, but she had to die because of what she represented. In any event, the standard of the Empress to which Bill draws our attention would not have been flown after Sissi's death, or at least after her funeral. It would very likely have been draped over her coffin at her funeral. There was no Empress until 1916, when Franz Joseph's distant cousin succeeded him as the Emperor Karl VI, often known unkindly as Karl der Letzte (Charles the Last). I assume that his wife, Princes Zita of Bourbon-Parma, who was the last Empress and who died in the late 1980s, would have had an imperial standard of her own, although I have never seen a representation of it. I have seen Kaiser Karl's Imperial standard. There was no specific separate standard for the Empress in ca. 1916, the only one that was prescribed on 12 October 1915 was that of Emperor and Empress and would have been presumably used when either of the two or both are present personally. It seems that this standard was rarely used, Baumgartner notes only a single occasion during Emperor's holidays on 22 December 1917 (was Zita there too?) and the possibility that it was used when the Emperor was visiting the front lines in 1918. There was no record of this standard being used aboard ships. Regarding the Standard we have seen in the picture - it was prescribed only in 1894, named Standerte Ihrer Majestät der Kaiserin und Königin (Standard of HM Empress and Queen), and thus would have been used by Sissi (Elisabeth of Bavaria) until her assassination in 1898. Before that, since 1828 a single design of thr imperial standard was used for all members of the imperial house, of a similar basic design but without the crowns in the corners. As Ron pointed out, there would be no purpose for this standard since 1898 until the succession of Emperor Karl I, to be used by his wife Zita, who would already have an other standard adopted in 1915. However, that does not mean that the Austrian naval ships would not have been equipped with such flag in their flag cabinets in the meantime and some probably remained there until the end of the Dual Monarchy. I wonder if that may not be the origin of the example we have seen. Empress Zita would have used the 1915 pattern Empress' standard as she came to the title in 1916. In an image from a Spanish-language website, found at http://nobleyreal.blogspot.com/2011_02_01_archive.html, the flag on Empress Zita's casket at her funeral in 1989 appears to be that shown above with the 1915 pattern. In addition to those, there is a flag preserved in the Croatian Maritime Museum in Split that I visited in 2004 - being similar to the archducal flag of 1894 pattern, but rectangular and with slightly different bordure, also missing the crown-lands coats of arms and being different in some other minor details (this last may just be result of simplification in the manufacture). Most notably the flammuly bordure extends only along three edges. The fact that the hoist edge is equipped as a flag sleeve may suggest that this was no naval flag at all, but was used attached on a flag staff - possibly as a military (army) flag or guidon of some kind. The height of this flag is approximately 60 cm (length, possibly 80 cm?). Does this sounds as anything recognizable from the A-H military? At http://www.kleinezeitung.at/tirol/lienz/doelsach/2789367/osttirols-letztes-geleit-fuer-den-kaisersohn.story can be seen a news article in German, with the flag, from the funeral of Dr. Otto von Habsburg, the last crown prince of Austria-Hungary. On the same topic: http://docelinajes.blogspot.com/2011/07/funerales-por-otto-de-habsburgo.html with very nice pictures also shows the flag over the coffin of his wife Regina and the high attendance at the mass and the funeral. Otto von Hapsburg died in 2011, but I've just come across two videos on YouTube which shows part of his funeral procession, with many, many flags - presumably those of organisations of which he was president, patron, etc. etc, and not all of them are from Austria. - the Teutonic Order at 3:20? followed by veteran's organisations (the flags look like Imperial Army colours and standards)? - at 13:09, are these perhaps shooting clubs? Most are ceremonial standards rather than flags; many appear to be based on the yellow Hapsburg Imperial flag, the white version used as a regimental colour, or the post-1918 Austrian flag.